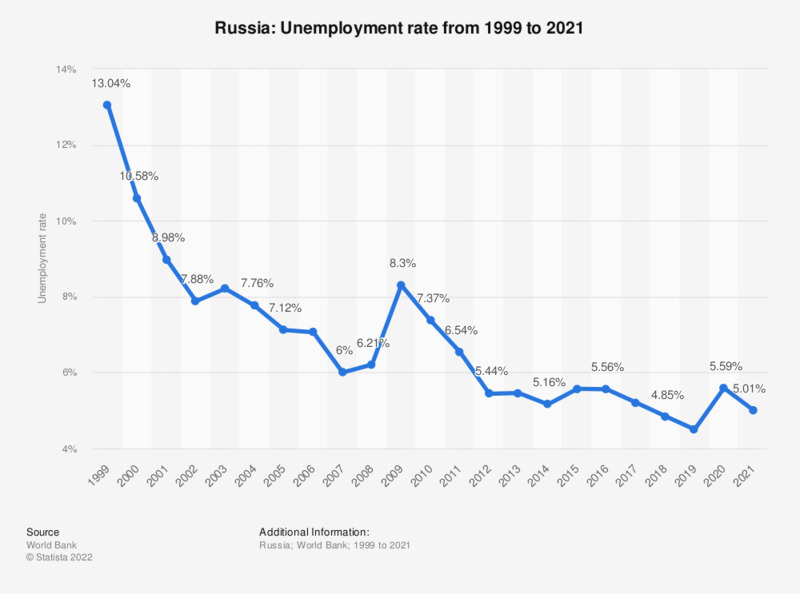 This statistic shows the unemployment rate in Russia from 2007 to 2017. In 2017, the unemployment rate in Russia ranged at approximately 5.2 percent. An unemployed person is defined as someone who is out of work and usually looking for work actively. Unemployment in a country is measured using the unemployment rate, which is an index calculated by dividing the number of workers out of work by the total workforce of a country, and then multiplying that figure by 100. The labor force is made up of the people who are old enough and physically fit enough to work. The unemployment rate is an important economic factor, but economists do not always agree on what exactly causes unemployment. They do agree, however, that unemployment typically rises during bad times for the economy, i.e. recessions. As for other important economic factors, Russia’s inflation rate has been decreasing for a few years now, while its real (inflation-adjusted) gross domestic product is still recovering from a steep decline in 2009. As most other economies, Russia’s economy focuses mostly on the Services and Industry sector, while the Agriculture sector plays little to no role when it comes to gross domestic product generation. Consequently, the vast majority of the labor force works in those two sectors. However, Russia is among the top wheat exporters worldwide, ranking third after the United States and Canada.